This template is a Microsoft Excel document that you can use and modify to best suits your needs. It can easily be modified to include additional sections if needed. 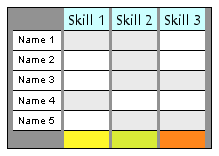 For example, you may want to add more rows to include more team members, or add more columns to include more skills. You can also use whatever scoring method that suits your need. If you face difficulties customizing this template or you lack time to do so, we will be happy to perform the customization for you. Let us know what you need and we will do our best to serve you. Please help us to make this template better by providing us with your comments or suggestions.